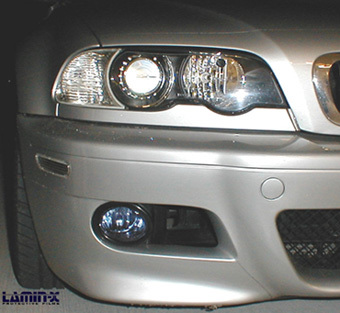 Tired of having to worry all the time about your TT MK2 headlights being scratched, rock chipped, or even cracked? Lamin-X Pre-cut kits are the solution to all your exterior lighting needs; Thick, Strong, Flexible, and Invisible, Lamin-x provides clear and colored protective films that protect highly impacted easily damages areas. Use on headlights, taillights, foglights, or many other surfaces. Preserve the value and appearance of your vehicle. Colors Available: Clear (20 / 40mm), Yellow, Blue, or Smoked. What is the difference between 20mm and 40mm clear film? 20 mm - Strong, perfectly invisible protection for lights and lenses. Keep your lights looking new for years and years.No more yellow, hazy lights from sand blasting and rocks chips. Very flexible and pliable for very rounded/curved light applications. Adhesive backed for easy and very forgiving application to any surface. Great heat dissipation properties for those high heat/intensity lighting. Handles up to 300-degree temps. 40 mm - Lamin-X's thickest and strongest film yet. 1/16th thick! Perfectly clear, invisible protection for lights and lenses. Keep your lights looking new for years and years. No more yellow, hazy lights from sand blasting and rocks chips. Adhesive backed for easy and very forgiving application to any surface. Excellent protection for flat and lower temperature lenses. Handles up to 300-degree temps. Complies with WAC 296-62-054 and 29 CFR 1910.1200. Product is impact resistant, softened PCV vinyl film. Cushioning effect reduces or eliminates projectile damage. Easily shaped and curved with heat. Installations errors can be corrected while being installed. Product is scratch resistant, but any created cracks or scratches will disappear with time. Resists yellowing with minor yearly maintenance (any UV protectant conditioner or screen - like Meguiars, Turtle Wax, Mothers, 303 Protectants). Product storage info: Do not store near heat or direct/indirect sunlight. Average shelf life of one year when stored in original packaging. Do not store in an unwound condition (will cause film to pull up from backing material over time). **Note: Testing information is, to the best of the company's knowledge, accurate under numerous conditions; however, it does not apply in all cases. The summary chart is intended as a guideline and all recommendations are made without guarantee since conditions of use are beyond our control. 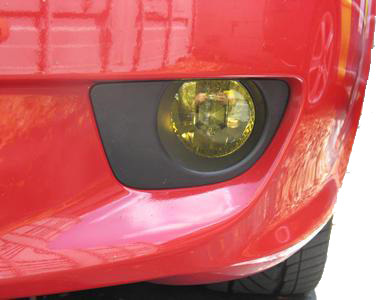 Tired of having to worry all the time about your TT MK2 fog lights being scratched, rock chipped, or even cracked? Lamin-X Pre-cut kits are the solution to all your exterior lighting needs; Thick, Strong, Flexible, and Invisible, Lamin-x provides clear and colored protective films that protect highly impacted easily damages areas. Use on headlights, taillights, foglights, or many other surfaces. Preserve the value and appearance of your vehicle. Small sized applications may be applied dry and medium to large light installations may be applied wet for best results. First, Clean lens thoroughly. Then peel backing off of film (prevent the film from touching any foreign surfaces). Wet application: spray a very light mist of water onto lens (one or two sweeping sprays from 10-12 inchs away is sufficient). Then align and apply film to one side or center of the light or area. Then using a plastic application card, press down/sweep the remainder of the film across the light. If large bubbles are present or film is misaligned, peel up the film to that area and apply again. If film is not precut then use an X-acto knife, triangular pointed knife, or razor blade to trim off the excess film. If product is precut then remove the handling tabs. Small air bubbles and creases/ripples will disappear over time film settles and is warmed. Minor scratches will also disappear over time and after film maintenance by waxing or applying 303 vinyl conditioner. Our paint protections include complete installation instructions, which describes the best installation method for each area/piece. Also included are labeled diagrams of kit. We are also available to verbally assist the customer if any questions or complications arise. If you do decide not to install yourself, we can attempt to locate professional installer within your general vincinity. Preparation: Make sure the area where the film is to be applied is clean and free from dust, dirt, grease or any other contaminates. (Use mineral spirits and/or clean soapy water to clean the surface thoroughly.) Best results are achieved between 60 and 85 degrees F. Wash hands thoroughly and keep saturated/wet with the application solution to prevent permanent fingerprints in the adhesive and prevent the film from properly adhering. Also make sure the film does not come in contact with the ground or any surface from which it may collect dirt or dust. Applying: Kit should be applied dry onto fog lights and headlights. For large lights, spray a very light mist of the water solution onto lens & liberally spray on outside of film (non-adhesive). Then align and apply film to one side or center of the light or area using the handling tabs . Then using a plastic application card, apply down/squeegee the very center of the film. Then apply the remainder of the film by moving in a spiral or circular motion working outwards towards the edge of the light. The key to positive results is distributing the film evenly so that wrinkles either do not occur or are manageable. Film is very forgiving, which allows you to pull and reapply numerous times if not satisfied with results. This can only be done upon initial installation, before the curing process. Note: warming the film with a heat gun or blow dryer can help to mold the film around any difficult, curved areas. Once applied: If film is not precut then use an X-acto knife, triangular pointed knife, or razor blade to score the outside layer of the film then trim off the excess. If product is precut then remove the handling tabs. Let film dry for a minimum of 30 minutes and carefully wipe off any excess solution. If all moisture has not been evacuated under film then some fogginess of the film will occur. This is completely normal. Film is breathable and porous – cloudiness/fog will evaporate with a few days to a few weeks. Depending on film thickness and sunlight/heat exposure. Any surface texture, scratches, or ripples will also disappear during this curing process. The film can be washed with soap and water just as you use on your car's finish. Light scrubbing is ok as well as a mild solvent if needed. It is important to wax the film at least 3 times a year w/ a good carnauba wax or 303-Products vinyl conditioner to maintain the film's U.V. protection. Applying: Film can be applied dry onto fog lights and smaller headlights. For large lights, spray a very light amount of the water solution onto lens & liberally spray on outside of film (non-adhesive). Then align and apply film to one side or center of the light or area using the handling tabs . Then using a plastic application card, press down/squeegee the film with smooth sweeping motions. Do this across the remainder of the light. If large bubbles are present, peel up the film to that area and apply again. Film is very forgiving, which allows you to pull and reapply numerous times if not satisfied with results. This can only be done upon initial installation, before curing process. Note: warming the film with a heat gun or blow dryer will soften it to help to mold the film around any difficult, curved areas. Once applied: If film is not precut then use an X-acto knife, triangular pointed knife, or razor blade to score the outside layer of the film then trim off the excess. No need to cut all the way through the film. If product is precut then remove the handling tabs. Let film dry for a minimum of 30 minutes and carefully wipe off any excess solution. If all moisture has not been evacuated under film then some fogginess of the film will occur. This is completely normal. Film is breathable and porous – cloudiness/fog will evaporate with a few days to a few weeks. Depending on film thickness and sunlight/heat exposure. Any surface texture, scratches, or ripples will also disappear during this curing process. Q - Can the film be removed without damage? 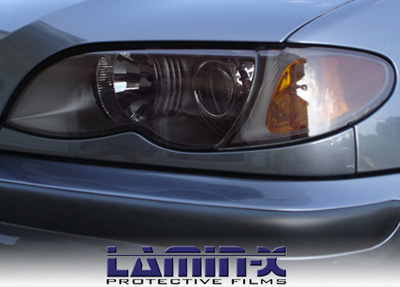 A. Lamin-x film can be easily removed without damage to the light or original paint. Upon initial application, the film can be pulled back up and reapplied numerous times if not installed correctly. The film and adhesive is forgiving enough for this. Once the film is settled (appx 48-72 hours) the product is not considered to be reusable. Upon removal warm the film and lift off slowly. 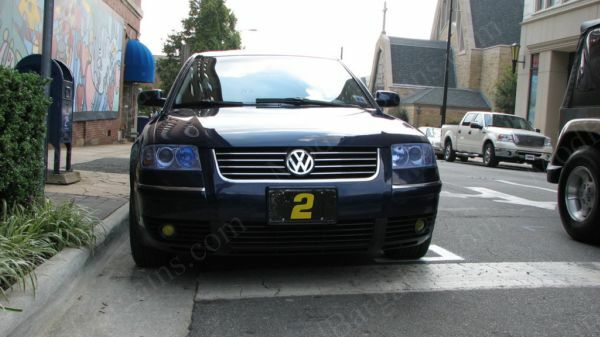 Q - Are your colored films legal on headlights for street use? A. Our colored films may not be legal for street use on primary lighting. An off-road disclosure is recommended. Please check your state or local laws before application. Installation of colored Lamin-x Films on your primary lights is done so at your own peril. None of our films produce a blue or red light when lit. Q - I just installed the film on my lights. There are still some tiny bubbles and milkiness underneath and creases/ripples on top of the film. What should I do? A. Once the film settles any small bubbles/milkiness or application creases will disappear. Lamin-x is a breathable PVC vinyl film. Tiny air pockets will evaporate. The creases/ripples caused by application cards or your finger will smooth out once settled and warmed. Q - What's the difference between your film and your competitors? - Our films are impact resistant and a softened PVC vinyl film. Most competitor films are not impact resistant and have a top-coated urethane film. - Installation errors can be corrected and repaired upon installation. - Lamin-x is breathable for quicker curing and allows for newly applied paint to fully cure. - Resists yellowing with minor yearly maintenance. - Multiple colors and thicknesses available for multiple uses. - Competitors only have clear films. No colors available. Q - What is the 5-year guarantee? A. Lamin-x Protective Films guarantees its products for five years from the date of purchase. The products are guaranteed against defective materials and workmanship, This guarantee is null and void if the products have been improperly handled or applied. Neither the seller nor the manufacturer shall be liable for any injury, loss or damage, direct or consequential, arising out of the use or inability to use the products. If the products are not proven to conform to specifications the seller's and manufacturer's obligations shall be to replace it at no cost to the purchaser. All expressed or implied rights, warranties, guarantees, or conditions, stutory or otherwise, are excluded. The foregoing may not be altered, except by agreement signed by the buyer and seller, and is void where prohibited by law. During the three year guarantee period, you Lamin-x Protective Films product will be replaced free of charge, when proof of purchase and the defective product are returned to the seller or the manufacturer.